New for 2019, the depth of the Motion AIR has been increased to allow for an optional two-berth annexe to replace the left-hand side panel. The front panel has also been redisgned and features a flexible yet simple to use 'D' door that can be half or fully rolled back, as well as a secondary mesh panel. 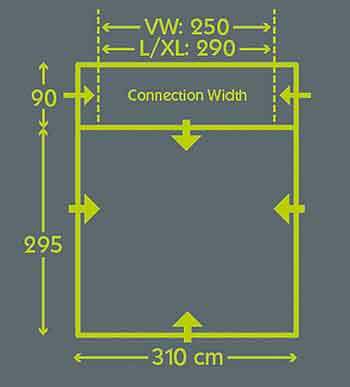 Please note: This is the VW model and fits vehicles with a rail height of 180 - 210cm. For vehicles with a rail height higher than 210cm choose either the L or XL models below. 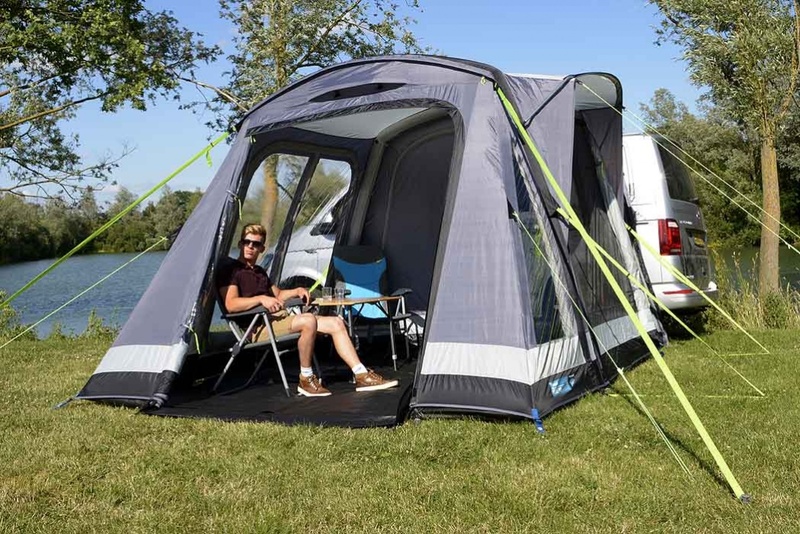 With airfarme technology and Kampa's single point inflation system the Kampa Travel Pod Motion Air is quick and easy to set up. It provides very good headroom and lots of useful space. 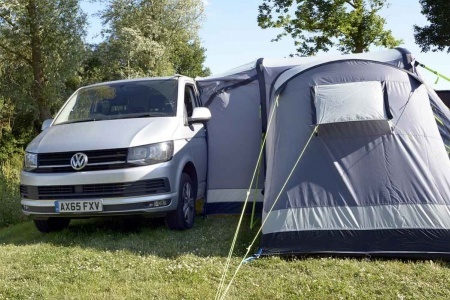 With a depth of 2.4 metres and a width of 3.1 metres, the Travel Pod Motion AIR VW provides an overall space of just over 7.4 square metres. Even more space is provided by the connecting tunnel - very handy for wet gear, dirty walking boots and other similar items. A nice feature of the awning is the ability to connect to your vehicle by a variety of methods ( see below for more detailed information ). For convenience and practical use of the awning there is a door either side of this tunnel and a large door from the tunnel into the front living area. With it's crystal clear, large panoramic windows, the awning not only has plenty of light coming in, but also provides excellent views out. There is a door on both the left and right side of the awning. The door on the right side has a canopy, enabling you to open the door when it is raining. The door on the right side also has a full mesh panel, as does the front of the awning. With the front door you can open and close either side of the front panel as you require and even drop the whole panel halfway for an open air, veranda type effect. The Travel Pod Motion Air uses an airframe ( also known as airpoles ) to replace conventional metal or fibreglass poles. Because these types of awnings are more lightweight they are generally easier to transport and position on-site than conventional awnings. The awning can be inflated quickly and easily through a single inflation point because all the poles are linked together. 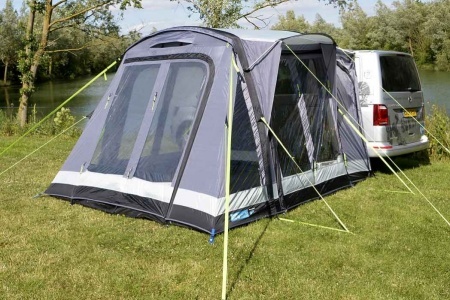 Additional advantages include the fact that the airframe is always attached ( no need to find or remember your poles ) and that there is less likelihood of damage to your caravan because only soft materials are fixed against it. 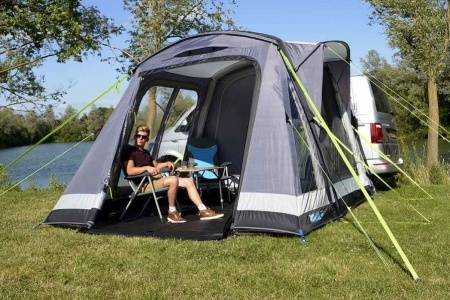 All things considered the airframe has become the trusted and most popular choice for today's caravanners. A high volume manual pump is supplied but an optional electric pump is available to make the process of inflating the awning even easier. 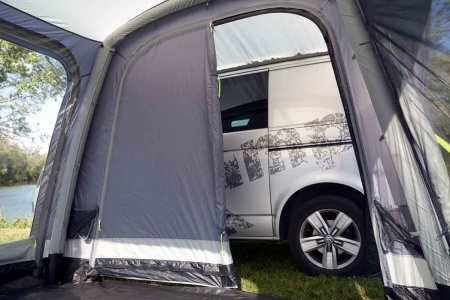 Drive-Away awnings offer convenience. They avoid the need to set up and take down your awning every time you wish to use your vehicle on the road. 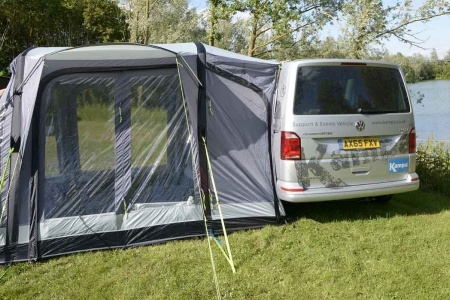 The Kampa Travel Pod Motion AIR VW is a free-standing awning that enables you to drive-away and enjoy your day out. Meanwhile, your awning remains completely set-up and is ready to be simply re-attached on your return. Door: Door in rear tunnel. 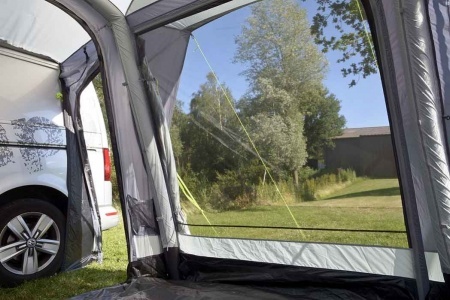 Awning Material: 'Feel the Difference' Weathershield™ HD 6000mm polyester - Durable and extremely weather resistant, this material's been protecting caravan and motorhomes since 2008.